Love that country Nothing like the great out doors Love horse back riding -Hiking-Fishing I like going to powwows . I love all animal's and like sitting back at times watching a good scary movie or Action To many things to mention . Looking for just a friend right now to do thing's with maybe go out hiking at my Favorite place the Red River Gorge..My Dog and I stinky love the hiking.. Does sacredheart1 belong in this group? 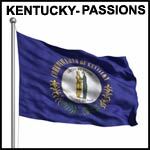 Native Kentuckian I'm born and raised in Kentucky, I've never lived anywhere else. Does mfinnie belong in this group?